For William Shatner, the actor who portrayed "Star Trek" captain James T. Kirk, naming one of Pluto's moons "Vulcan" is the only logical choice, and more than 100,000 apparent Trek fans agree. 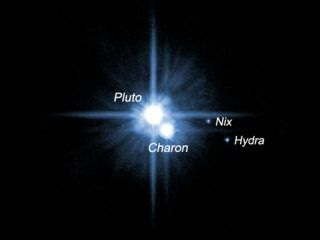 Shatner proposed "Vulcan" as a potential name for one of Pluto's moons, the recently discovered P4 and P5, as part of the Pluto Rocks contest launched by the SETI Institute on Feb. 11. Now, Vulcan — which on Star Trek is the home planet of Kirk's pointy-eared first officer Spock — has a commanding lead worthy of Kirk, it seems. "I think we are over 100k votes for Vulcan on PlutoRocks.com that's wonderful!," Shatner wrote from his Twitter, @WilliamShatner yesterday (Feb. 19). Shatner also suggested that SETI add Romulus — the Roman god of fire and the twin brother of Remus in the Roman foundation myth — to the list of possibilities, but SETI officials nixed that name because it was also the name of an asteroid's moon elsewhere in the solar system. In Star Trek lore, Romulus is the home planet of the Romulan alien race. The moon P5 was discovered in 2012, also using the Hubble telescope. The moon P4 was discovered in 2011. Once voting on the Pluto Rocks website closes on Feb. 25, SETI will review the contest and make recommendations for naming P4 and P5. Ultimately, the International Astronomical Union is responsible for naming the moons. While the IAU will take the contest results into consideration, the organization still has final say over what the tiny moons are named. A new batch of written-in names was also added to the list on Feb. 14, two days after Vulcan was accepted on Feb. 12. "By the way, if you are a fan of one of our eight most recent additions to the ballot, please don't give up!" Mark Showalter of SETI wrote in a blog on Feb. 18. "They may be way behind in the voting, but we realize that they had a big disadvantage by not appearing till Thursday. A late surge of support is something we would surely notice."